Water, Isononyl Isononanoate, Cetyl Alcohol, Glycerin, Neopentyl Glycol Diheptanoate, Propanediol, Glycolic Acid, Caprylic/Capric Triglyceride, Dimethicone, Arachidyl Alcohol, Behenyl Alcohol, Sodium Hydroxide, Hydroxyethyl Acrylate/Sodium Acryloyldimethyl Taurate Copolymer, Glyceryl Stearate, Peg-100 Stearate, Cyclopentasiloxane, Squalane, Phenoxyethanol, Dimethicone/Vinyl Dimethicone Crosspolymer, Cyclohexasiloxane, Arachidyl Glucoside, Magnesium Aluminum Silicate, Ammonium Acryloyldimethyltaurate/Vp Copolymer, Caprylyl Glycol, 1,2-Hexanediol, Citric Acid, Mandelic Acid, Xanthan Gum, Parfum/Fragrance, Bisabolol, Polysorbate 60, Allantoin, Sodium Pca, Disodium Edta, Ethylhexyl Palmitate, Adenosine, Myrothamnus Flabellifolia Leaf Extract, Farnesol, Limonene, Evodia Rutaecarpa Fruit Extract, Butylene Glycol, Ascorbic Acid, Faex/Yeast Extract/Extrait De Levure, Opuntia Coccinellifera Flower Extract, Citral, Silica Dimethyl Silylate, Bht, Ethylhexylglycerin, Hyaluronic Acid, Silanetriol, Sodium Hyaluronate, Sorbic Acid, Hexylene Glycol, Linalool. You can see the cream contains glycolic acid, citric acid, mandelic acid, fruit/ flower extracts and acids, and hyaluronic acid. I’m not surprised to find these ingredients, nor am I questioning their roles. I already knew that they were powerful and very important, and I’ve now satisfied myself that there is nothing brand new or novel in this pricey cream. Therefore I can now go find a less expensive alternative to it (on Amazon.com, because that’s where I go for almost everything.) Once I’m on Amazon I’ll do a search in skincare for creams with these ingredients, and out of those results I’ll read the ingredients for each and using that and the user reviews, I’ll determine which are worth their prices. Okay, I’m not going to spell it out any further, as you can see where I’m going here. In this case the toner provides my skin with many of the key ingredients I want, but I’ll have to look at layering this with another product containing hyaluronic acid to help plump my wrinkles. I don’t have to look far: Derma e has a whole line of products featuring hyaluronic acid. 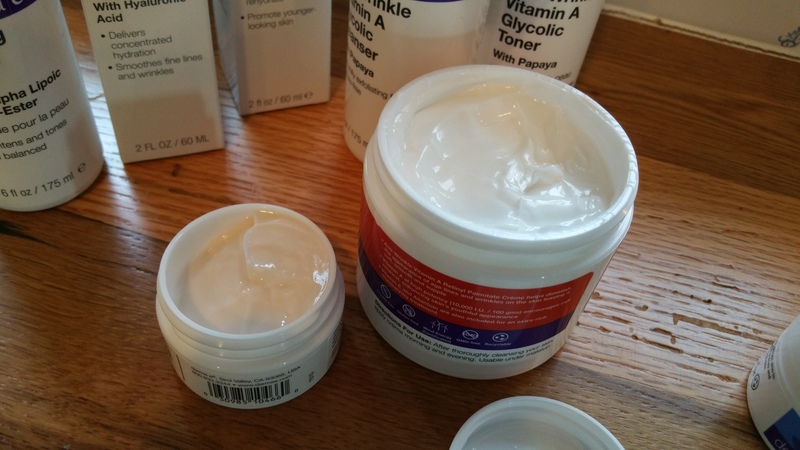 There is no exact science to deciding how to layer your products. For me, a change in routine is welcomed so I tend to have a few different skincare options for any given day. For example, I can use retinol in a cream, toner, serum, or face wash. I have hyaluronic acid available in a serum, mist, and cream. This is not too crazy when you consider how economically friendly most of the Derma e products are. If I don’t get bored with my skincare routine then I probably won’t skip it. And let’s face it– we don’t always feel like using a toner, serum, cream, and BB/CC or SPF before leaving the house in the morning. So there are clever ways to work around that and customize a routine or routines you like. I love the fact that Derma e makes mists and face washes containing key ingredients. 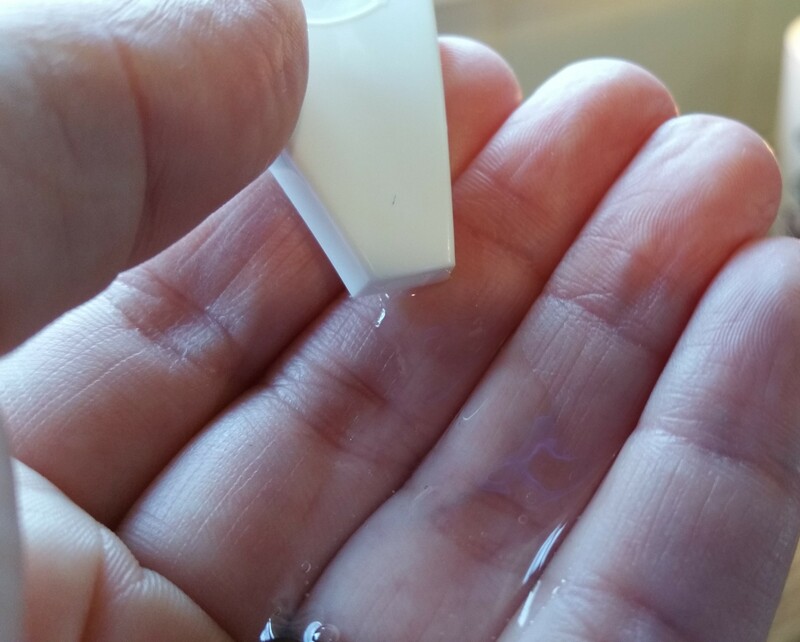 How easy is it to get your retinol from washing your face? Just use it in your daily shower. And why not replace your Avene or Evian purse spray with one that has active ingredients? I think the Derma e Hydrating Mist sounds great for the summertime. Pop it in the fridge and spritz it on when you come in from walking the dog on a hot day. Let me tell you a bit more about these six particular products I chose. 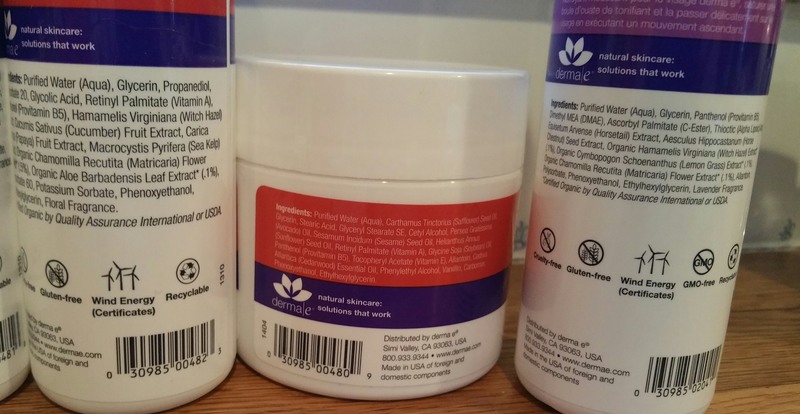 First you should know that Derma e’s products may contain added fragrance (you can find ones that don’t by checking out their website page on this subject). The Vitamin A line seems to be consistently scented like violets. It didn’t dawn on me that fragrance had been added to it when I first started using the toner. I actually thought the ingredients were giving off their own smells, resulting in something that was very pleasant. Even after figuring out that fragrance had been added, I still look forward to using this line because it smells great. But anyway, I wanted you to know about this in case fragrance offends you. 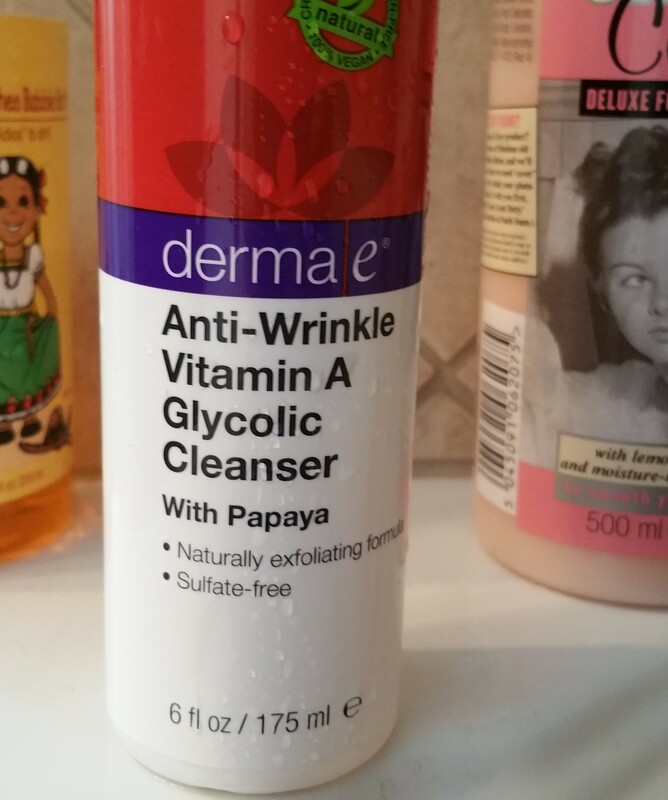 Since adding to my Derma e collection, my favorite skincare product is probably now the Anti-Wrinkle Vitamin A Glycolic Face Cleanser. I just love the convenience of this cleanser: the cleanser pumps out perfectly, it contains retinol, it smells great, it’s available on Amazon and on “Subscribe & Save,” and it just makes me happy. The Derma e hyaluronic acid line is another gem altogether. If you’re feeling underwhelmed by your skincare routine or especially old and wrinkled lately, think about adding in one of these guys. It’s really cool to see your skin look plumper and your wrinkles softer after just a few days of using hyularonic acid. Seriously, take before and after photos when you do it. I’m not saying your wrinkles are necessarily going away that quickly, but even just temporary results are great for me. 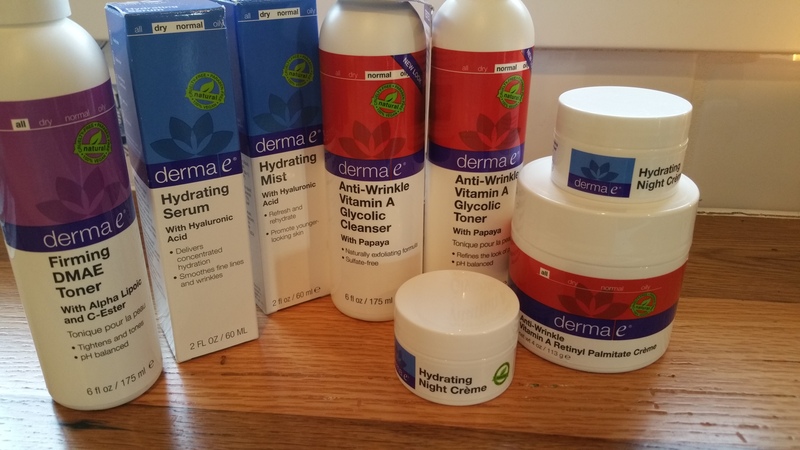 After being so pleased with the products I’ve tried so far, I’m definitely going back to look at Derma e’s other product lines. I have room in my bathroom for another face scrub and maybe another serum….